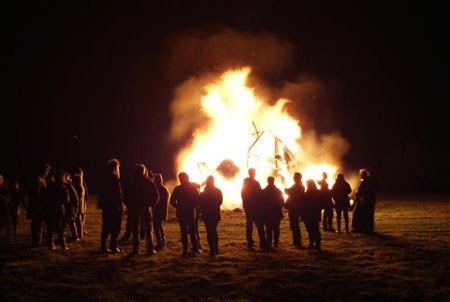 What remains after the bonfire: How do we define success of an event? During the last few weeks I was heavily involved with the SHIFT Week of Innovation Action, a series of parallel events taking place in 21 different country offices. Over 50 practitioners were invited to ‘shift’ from one country office to another to share their experience on innovation methodologies and what they learned from their ongoing innovation projects (many of them funded by UNDP’s Innovation Facility), learn from others, and ‘shift mindsets’ in the process. As part of the team that coordinated the event week I was in awe of the incredible energy coming from country office colleagues and the enthusiasm, creativity and time commitment on the side of organizers, participants, and the coordination team here in New York. And from the feedback that has been rolling in so far (the evaluation survey shows about 95% of participants were satisfied or very satisfied with the event) it seems the SHIFT initiative was a success all around. Yet, we all remember other instances of well-organized events which achieved great visibility, but when people were asked there months later what the impact of the event has been, we didn’t have much to show for it. So you had a nice event that brought people together and left everyone happy and excited, but so what? What came out of it? I believe we have to be very honest about how we define success of events. Yes, it is good when participants convey in a survey how much they enjoyed the gathering. And it is also great when the event achieves visibility and external recognition with good communication during and immediately after the event, such as national media coverage of the SHIFT hackathon in Belarus, great videos produced about SHIFT events in Haiti, Montenegro or Georgia, or outreach products such as the SHIFT Exposure compilation, that give audiences a glance of what happened. But it is not enough. Because if 12 months from now, none of the new ideas generated will have inspired actual initiatives, projects or products, if none of the innovative prototypes developed will have been applied in real life, none of the solutions shared will have been successfully replicated or brought to scale, and no one who couldn’t participate in person has a chance to learn from what was discussed the event – then I don’t think we can call the exercise a success. Then it will just have been a bright bonfire that burned for a single night. We have a nice picture of it, but it will not warm anyone going forward. Rather than letting organizers and participants disperse after a good event, let’s use the current momentum and excitement when people return to their offices. Make a plan on how we want to communicate the results, increase visibility and leverage the event’s discussions and activities to initiate new collaborations, products and projects. Maybe this is the opportunity to promote an existing Community of Practice (COP), or establish a network of mentors around your topic! Make sure to use all available channels, from internal COPs, to external online networks (LinkedIn, Devex, DGroups, World Bank networks, etc.) to public social media channels (Twitter, Facebook, Slideshare) and try to engage new audiences. Communication products and activities are crucial for getting recognition and visibility, and for reporting back to donors. But the important substance, the ‘meat’ of knowledge and learning points is what others really need in order to apply the results of the event to their work. Where can new colleagues who join the organization six months from now access the video recordings and slides of the presentations given so they can follow the event’s learning points? Where can they find blog posts and short interviews with personal insights and reflections of participants on what they learned at the event and how they intend to apply that to their own work? And where are the hands-on knowledge products that help them review the examples shared and apply the solutions that were discussed? If there are only glossy brochures and good-looking PR videos, but no substantive project examples, how-to articles, lessons learned summaries, guidance notes or toolkits coming out of the event, then we might look good externally, but the event was still a failure for the organization as nobody other the handful of on-site participants will learn anything from it. One of the reason we as organizations facilitate working-level events is to fulfil our role as a broker of exchanges to inspire and improve our projects and programming. We must come to an understanding that we cannot afford to organize events that look great from the outside but that do not result in concrete, improved approaches, projects and initiatives that are being replicated and scaled up in other countries and regions. We need to wrap up events with concrete commitments on what will happen next, and be diligent in checking-in with organizers and participants at different intervals after the event on how their commitments, prototypes and follow-up activities are evolving (and no, just planning for the next event to discuss the issue further doesn’t count! ;). That means that as an organization we have to expect more from participants than showing up and consuming presentations, but rather for all to become part of an active knowledge production and application process that extends far beyond the event’s closing session. This is all much easier said than done. For SHIFT week, our team is trying to practice these points, by setting up an editorial calendar through which we will keep communicating about SHIFT results in the upcoming weeks and months, by supporting the formation of mentor groups for follow-up questions, and by following up with teams on potential knowledge products that could emerge from different events. I know there will be a lot of imperfections along the way, but if at the end of the day there will be more products that others can really learn from such as the Guidance for Project Managers on Crowdfunding, the live-stream recordings from Jamaica and Egypt on design thinking with governments or the top tips and questions from the SHIFT Rwanda coffee learning session, and if brilliant initiatives such as the 112 emergency service for people with hearing and speech impairments in Georgia, the bilateral knowledge exchange on public service centers between Bangladesh and China and others can be turned into re-usable guidance for other countries to build on, then we can truly say that the SHIFT Week of Innovation Action was a huge success. In your option, what other elements are important for defining success of events?